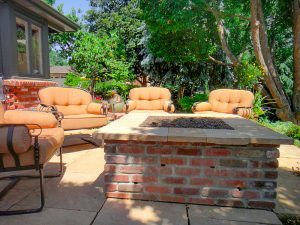 A Perfect Landscape’s residential and commercial landscaping services include custom fire pits installation and fire pit design to enhance your Denver, CO outdoor living space. Our professionally certified landscaping contractors are experts in innovative fire pit design and can provide affordable fire pit installation to bring your unique fire pit ideas to life. Our Denver area clients trust us as their local landscaping company of choice due to our exceptional customer service and knowledge on designing and installing custom fire pits. These fire pits serve as beautiful accent pieces for backyard patios, front yard decks, and gazebo retreats. Whether you need a simple fire pit design to match your existing backyard landscape or want a large-scale firepit as a focal point for your business’s outdoor patio, our fire pit design and installation team can make it happen efficiently and cost-effectively. Our Denver area clients trust us as a local landscaping company to provide exceptional customer service and the knowledge necessary to design and install custom fire pits as beautiful accent pieces for backyard patios, front yard decks, and even the occasional gazebo retreat. Whether you need a simple fire pit design to match your existing backyard landscape or want a large-scale firepit as a focal point for your business’s outdoor patio, our fire pit design and installation team can make it happen efficiently and cost-effectively. 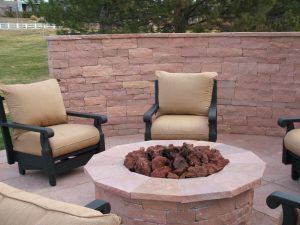 As local landscaping contractors, we recognize the benefits of having a custom fire pit as part of your Denver commercial or residential landscape. Colorado’s natural landscape and varied climate makes fire pit installation a vital part of any outdoor living space. Custom fire pits can ward off the slight chill in the air in the early spring and fall — and yes, even the summertime – to allow you to enjoy the beautiful outdoors even when the temperatures change unexpectedly. With a warm fire pit to sit around, you don’t have to change your outdoor entertaining plans due to the unpredictable Denver weather. A firepit also instantly adds beauty and value to your home or commercial property. Our fire pit builders ensure your custom fire pit is naturally integrated with retaining walls and existing landscape architecture, to make your outdoor living space an extension of your home or business. Natural Gas Fire Pits: A natural gas fire pit never runs out of fuel, saving you time and money. Natural gas fire pits are often larger in scale and can easily become a stunning focal point for your outdoor landscape. Natural gas fire pits can also be uniquely designed. Popular natural gas fire pit designs include a table-top or sunken fire pit design built directly into the ground. A Perfect Landscape’s custom fire pit designs and proper planning will give your landscaping project the final touch it needs to create an outdoor living space or outdoor kitchen perfect for entertaining, relaxing, and enjoying weather year-round! NOTE: A Perfect Landscape wants to ensure we keep your Colorado home and business safe. We are required to follow city ordinances, thus, if there are wood-burning fire pit restrictions in your county, please read the below links**. A Perfect Landscape is dedicated to making a safer, more beautiful Colorado. 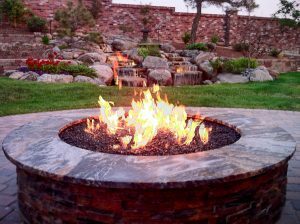 Call the experts on fire pits at A Perfect Landscape –(720) 851-3034 — to schedule an appointment to discuss your fire pit installation and custom fire pit design ideas.